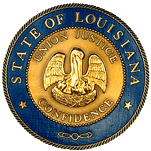 HB36 SHADOIN HIGHWAYS - Designates a bridge located on Louisiana Highway 2 in Union Parish as the "Alvin Green Memorial Bridge"
HB227 JIM MORRIS HIGHWAYS - Designates the section of I-49 from the overpass at the U.S. Hwy. 71 interchange, in Caddo Parish, to the Arkansas state line in memory of Greg Wall, P.E. HB674 WHITNEY BRIDGES/FERRIES - Renames a portion of Louisiana Highway 24 over Bayou Terrebonne in Gray, La., as the "Northpark Bridge"